Leading sales trainer, researcher and CEO of Hoffeld Group, David Hoffeld, blends cutting-edge research in social psychology, neuroscience, and behavioral economics in The Science of Selling to show how to align the way you sell with how our brains naturally form buying decisions, dramatically increasing your ability to earn more sales. Unlike other sales books, which primarily rely on anecdotal evidence and unproven advice, Hoffeld’s evidence-based approach connects the dots between science and situations salespeople and business leaders face every day to help you consistently succeed. There are two common rules or bits of wisdom that most salespeople learn early. 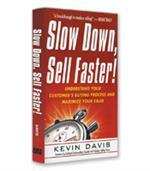 The first is that extroverts make better salespeople. The second commonly accepted piece of wisdom about selling is that you should never ask a prospect how he or she is feeling at the beginning of a conversation. This sounds too “salesy” and manipulative. The problem with these two commonly accepted examples of sales wisdom, according to sales trainer and consultant David Hoffeld, is that researchers have proven them false. In a new book entitled The Science of Selling: Proven Strategies to Make Your Pitch, Influence Decisions and Close the Deal Hoffeld argues that numerous studies prove that extroverts do not make the best salespeople. The best salespeople (nearly twice as productive in one study) are ambiverts — people who fall in the middle and are neither introverted nor extroverted. Likewise, Hoffeld uses academic research to dispute the notion that asking people how they feel is counterproductive in a sales conversation. Social psychologist Daniel Howard proved through his work with representatives of the Hunger Relief Committee that asking potential donors how they felt had a significant positive impact on donations. These two fallacies are just two examples of what Hoffeld says is the core problem with sales methodologies today: They are not based on the scientific evidence available concerning how people are persuaded and why they might buy. 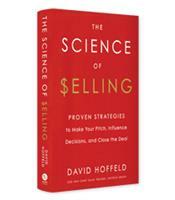 The Science of Selling is Hoffeld’s attempt to inject science into modern-day sales strategies and training. Thanks to science, the process of making buying decisions is no longer a mystery, Hoffeld writes. Behavioral scientists Richard Petty and John Cacioppo identified two methods of influence, which Hoffeld adapts to the sales process. In the context of sales, the peripheral route of influence identified by Petty and Cacioppo concerns factors that are outside the core sales message but still “have considerable sway on how we make decisions,” Hoffeld writes. These factors are mental reflexes, or “heuristics.” Researchers have identified many of the heuristics that influence how we make decisions. One heuristic, for example, is asymmetric dominance effect, which explains why presenting alternatives that are dissimilar (“asymmetric,” if you will) makes decisions harder. The likeability bias and social proof (knowing that others are buying the product) are two other heuristics that, Hoffeld writes, salespeople can use to influence buyers. The second method of influence — the central route of persuasion — refers to the actual core sales message, and it is at the heart of the book. Hoffeld conducted his own research over six years that combined a thorough review of the academic evidence with extensive study of sales calls. The result was a science-based methodology for selling based on six “why” questions: Why change? Why now? Why your industry solution? (The lesson here: Competitors may not come from your industry.) Why you and your company? Why your product and service? Why spend the money? Throughout the book, Hoffeld describes, based on science, how to gain the prospect’s commitment on these six “whys.” He also covers, among a number of other topics, the factor of a buyer’s emotions, science-based presentation strategies, and how to neutralize competitors and overcome objections. 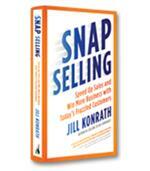 No one, Hoffeld writes, said “scientific findings on how the brain formulates a buying decision.” In this fascinating book, Hoffeld succeeds in exploring the many ways that salespeople can use advances in social psychology, neuroscience and behavioral economics to be more successful — with no wishful thinking involved.